In September I spoke at the AEC Tech Symposium. With Mostapha Roudsari, we discussed how some of the most recent web-based development projects at CORE studio – including VRX – are enabled by open-source initiatives and how these platforms are being used for better collaboration inside and outside Thornton Tomasetti. This past year at Thornton Tomasetti’s CORE studio, I have been designing and developing VRX – a project to view Building Information Models in Virtual Reality. This web application allows the model creator to guide others in a shared virtual environment using the Google Cardboard. I just published a blog post about it, and you can read more about it here. Next week, I’ll be teaching a workshop called Prototyping Experiential Futures at the Association for Computer Aided Design in Architecture (ACADIA). The 3-day session will be co-taught with Woods Bagot’s Director of Technical Innovation Shane Burger. See description below and sign up! The field of Interaction Design has come to dominate our experience of the digital world. As our physical world increasingly takes on digital threads in our everyday experiences, the role of the architect needs to actively engage IxD for the built environment. We need to move from prototyping form to prototyping experience. Tomorrow we will be presenting Horizon House at the Graduate School of Design as part of the program of ‘Innovate Talks’, introduced by the Chair of the Department of Architecture Iñaki Abalos and moderated by Professor Mark Mulligan. 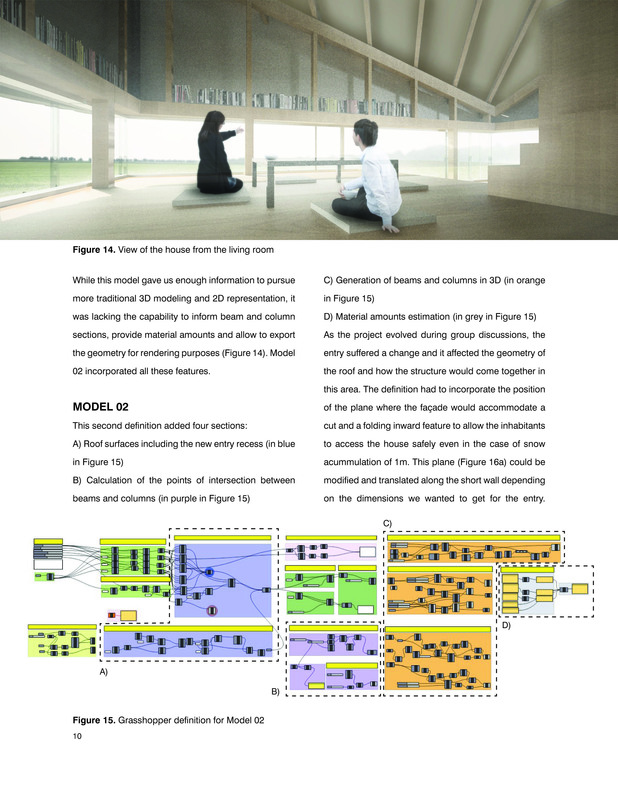 We will be explaining how the competition asked for a sustainable solution for a retreat in nature set in rural Hokkaido (Japan) and we envisioned a house built with re-used local materials. 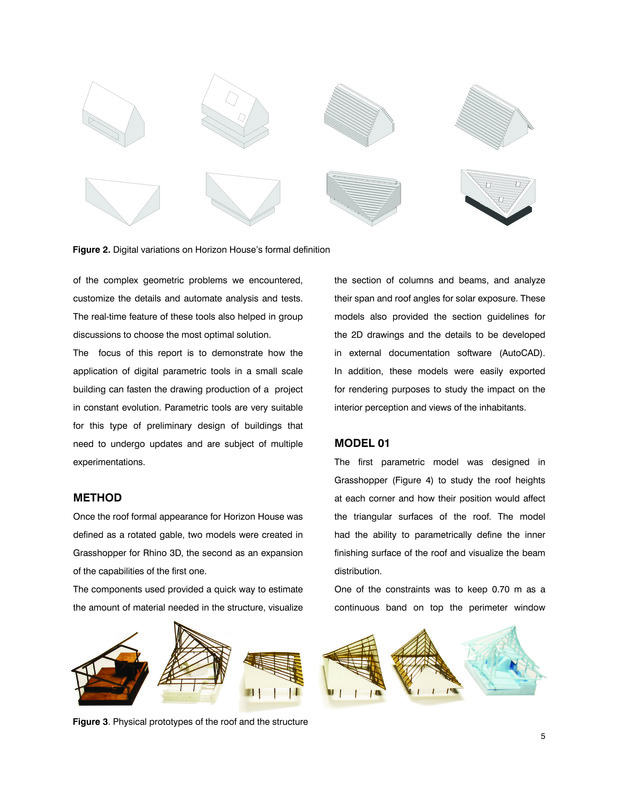 In March of 2013, I created a simple Grasshopper model that allowed for geometric explorations but also provided a general overview of material needs. You can check out the definition and some of the iterations below, extracted from a report I submitted at the end of the Spring semester. In addition, I have attached some of our original construction drawings. 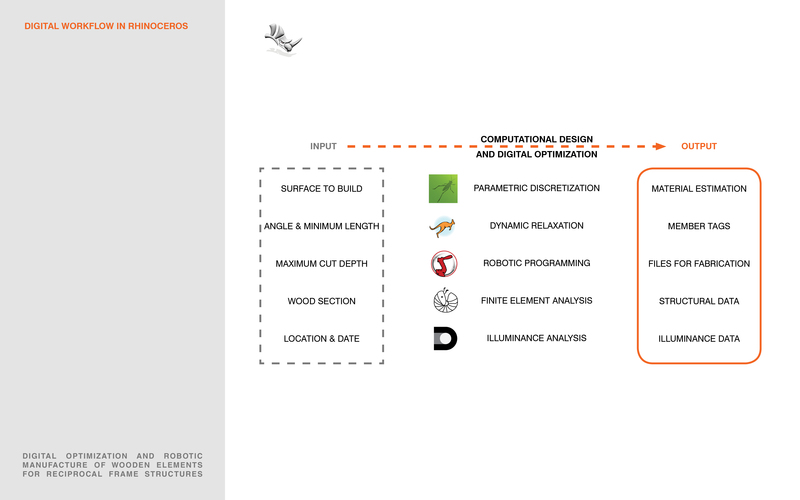 This will be part of my thesis mid-term presentation on digital design and robotic manufacture of wooden reciprocal frame structures, which will take place next week. The digital workflow described is under development.I have made some tests using the robot and it seems to be going in the right direction. I will post pictures of the prototypes in the next few days. Among other features of this workflow, the designer can access each larger ‘quad’, by using a path number that is the same of that of the original face it belonged to, while they can also retrieve the smaller configurations, which respond to the numbering of the vertices. More features coming soon!